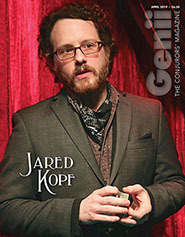 We feel that Genii—now in its 83rd year of publication—is the finest magazine in our field. And everyone agrees: it is the largest selling magic magazine. 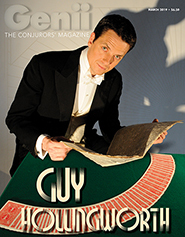 Since 1936, Genii has been the magazine every magician has looked to for the best feature articles, latest news, fantastic tricks, and finest reviews of the most recent tricks, DVDs, and books. Your ads appear in our paper magazine, mailed directly to thousands of subscribers around the world. Your ads appear in our digital magazine at no extra cost to you. 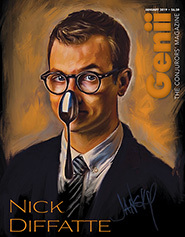 Genii’s digital magazine is free for all subscribers. 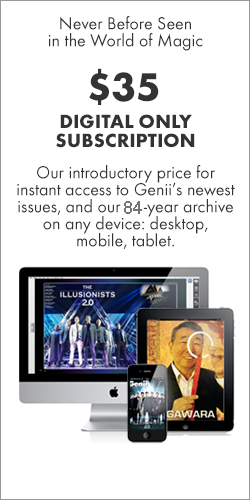 Genii gives digital access FREE to every subscriber across all platforms: iPad, desktop, laptop, smartphone (including the iPhone), and any tablet—all are FREE. All multimedia, including videos included in your advertisements, downloads with the digital issue onto the readers’ device. 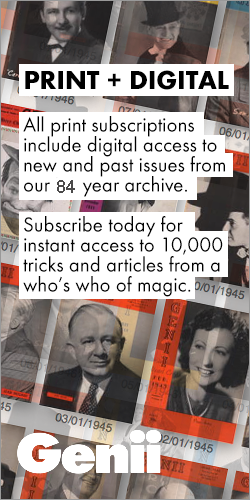 Genii has thousands more digital readers than any other independent magazine. Your ads in our digital edition are hot-linked directly to you: all the reader has to do while reading your ad in Genii is to tap the screen and be instantly transported to your website. The digital edition of Genii supports embedded videos, and if you have video demos of your products, we are happy to embed them directly into your ads AT NO CHARGE. Contract Advertisers who reserve a quarter page ad or larger for 1 year receive a complimentary subscription to Genii. Option 1: 12 month contract advertising at discounted pricing equivalent to one free ad through the life of the contract period. Option 2: Bi-monthly contract advertising at discounted pricing equivalent to half-off one ad through the life of the contract period. The contract applies for the same size ad for either contract. Advertisers may submit new content as they wish. Payment will be made monthly. Please refer to the Ad Specs for ad requirements. Ads must be submitted with completed Ad Spec Form. Payment may be made by check, international money order (payable to Genii), Visa, MasterCard, AMEX, Discover or PayPal (genii@geniimagazine.com). For credit card, include full name, address, card number, expiration date, and telephone number. All payments must be in U.S. funds. If you prefer to be billed, we will send you an invoice and tear sheet when the issue is printed.